The Big Microsoft Announcement: Will It Be An iPad-Killing Tablet? Rumors are flying and excitement is running high concerning a major announcement coming from Microsoft Corporation on Monday, June 18th 2012. Could this be the unveiling of the first iPad killer? Nobody knows... but here are my thougts! First of all, I'm still salty that Microsoft dropped the ball and never released the Courrier tablet back in 2010. It was a double-screen folding book tablet that had a stylus. Everyone knows that I'm a huge fan of the stylus with mobile devices. The Courrier would have been a first of its kind concept that was different from the iPad or any other tablet. But I don't think this new device will be similar to the Courrier. My prediction is that this will in fact be more of a traditional tablet device, but something that will be ground-breaking with the new Windows 8 operating system and live tiles concept. 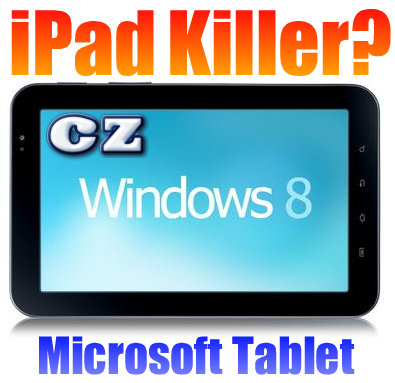 If anyone can make an iPad killer, it would be the Microsoft Corporation. But I don't see them taking on the iPad market head-on. With the recent news of Google developing their flagship Nexus Tablet device that boasts a possible super-low entry level price for a "quality" tablet, I think the lower-end market is more ripe for the picking. I'm not of the opinion that people are looking for another $600 to $800 tablet device other than an iPad. I see Microsoft hitting the tech sector with something more in the mid $300 price range that will turn heads and draw people away from the Amazon Kindle Fire, the B&N Nook Tablet, and the upcoming Google Nexus Tablet. But this device will possibly have features that would motivate people to spend the extra dough to get their hands on this new gadget. It makes sense to me that Microsoft would create a device that builds on the Windows Phone Mango platform, which could quite possibly be Windows 8. This would fit perfectly within their current offerings, and fill the gap where they don't have a presence. We know that Microsoft does not actually manufacture their own hardware, as is the case with the XBOX gaming system that rules the roost in the gaming industry. So could this possibly mean that Microsoft could team up with Nokia again, makers of the flagship Windows Phone Mango smartphone? I think yes. Nokia is off to a slow start with the Nokia Lumia 900. Partnering again with Microsoft on producing a new Windows 8 (or Windows "RT") tablet would certainly give the company a much needed boost. And with rumors still swirling around a possible buyout of the Nokia corporation for $8.8 billion, I'd say that the Redmond tech giant wouldn't be thinking of partnering with anyone else to build such a device. We will keep our eyes on the horizon and see what unfurls by Monday, and follow it all the way to the end. At this point, I think Microsoft Corporation knows that they can't flop out a dud and miss out on this late opportunity to finally put a dent in the solid tablet market that is owned by the Great Fruit Dictatorship.